You might like to pour yourself a glass of wine. In the words of the Woody Guthrie song, I have done some hard travelin’ and this blog is long. Most of it is in diary form, covering five days, and I end with one concluding thought. I have a guide. Lasha Tkeshelashvili is a young man with good English and solid trekking experience. 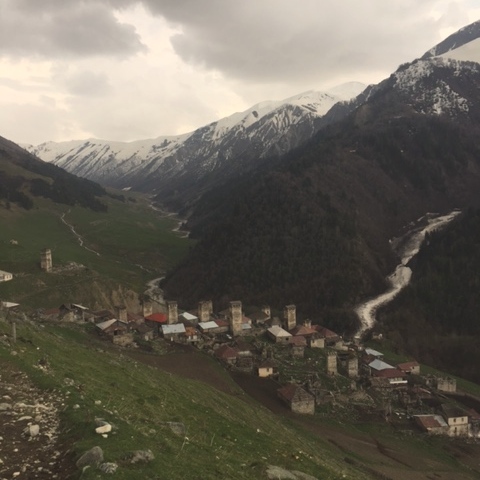 The aim is to walk for four days, with Ushguli, one of Europe’s highest settlements, as our destination. We head east out of Mestia and the town’s small airport below us gradually looks even tinier as we climb through woodland and meadow. With great mountain views to the north of us, Lasha talks about how local people used to cross these high places to find work in Russia. After the dissolution of the Soviet Union and a five-day war between Russia and Georgia in 2008, no one crosses these high passes today. Lasha also talks about how he came to choose guiding. After university he spent three years as a loan expert in a bank, but as he tried to work with loan figures images of mountains kept dancing before his eyes. So he quit. Shortly we reach the highest point of the walk and then it’s down a pine-scented path for a coffee break in the home of a relative. The rest of the day is an easy walk following the Mulkhura river. Lasha tells me that wolves sometimes swoop down from the forests into this valley and kill livestock, including cows. This tends to happen, he says, at the onset of winter. Another piece of information is that plans are advanced to build a ski resort. We see the chairs for a lift stacked on the valley floor and pylons for the chair lift are built. Wolves and skiers could soon be sharing a valley. After walking 14 km we arrive at our guesthouse, in the village of Zhabeshi at the top of the valley. The house is distinctively furnished, with a stuffed bear in the main room and a copy of the tragedies of Shakespeare, in Georgian of course, in my bedroom. The evening is a real highlight. Before travelling to Georgia I had heard about the tradition of the supra, a banquet presided over by a toast-master called a tamada. The guesthouse owner, Giorgi Naveriani, decides that our meal together is a supra. He presides and Lasha translates. We drink home-made apple vodka and Giorgi’s first toast is to God. “The first toast is to God everywhere in Georgia,” explains Lasha. The second toast is to the archangels Michael and Gabriel – this, says Lasha, is the standard second toast in Svaneti. The third toast is to St. George, which seems only fair. “We believe that St. George will give us many sons,” explains Lasha. The fourth toast is to the memory of those who died and we all spill a libation on the floor. Lasha then proposes the sixth and last toast – to St. Mary, who will look after our families. A little mischievously, I ask Lasha whether it would have been acceptable to sneak in a toast to Manchester United, say, as the fifth offering. Lasha is adamant that this would not be acceptable. As the sixth toast then? Yes, that would be fine. It seems the first five toasts are girded around by strong tradition and all in all I feel that I have been given a glimpse of the Georgian sense of the sacred. In my mind I had built up the tamada as a rather loud, life and soul of the party type. But Giorgi is softly spoken and the whole experience is profoundly moving. We set out in a southerly direction from Zhabeshi and start climbing. After two hours we reach the snow line and walk through groves of rhododendron. We’re tackling an ascent of 800 metres, walking up to 2400 metres. Normally this wouldn’t be a big deal, but snow is a game changer. “We use twice as much energy in snow,” says Lasha and my aching body agrees. We finally reach the highest point of the hike and take a break. It is my first experience of thunder and lightning up quite so close and personal. It is terrifying and somehow all of a piece with the grandeur of the Caucasus. Further on we watch an eagle, soaring higher and higher until it is lost from view. We walk down past great banks of primroses. Suddenly, after an 11-km walk that has taken seven hours, the village of Adishi comes into view below us. It looks exquisite with its Svan towers. But when we reach Adishi I revise my view; it looks like a disaster zone. Practically all the stone buildings are in ruins and many of the newer wooden ones are abandoned and in decay. Dotted around in this scene of desolation are a few inhabited houses. In a sense, Adishi is a disaster zone; Lasha says an avalanche hit it in 1986. No one died, but many buildings were damaged and some villagers left for good. When we reach our guesthouse, the middle-aged owner tells us that 11 families live in Adishi, as opposed to some 45 in his youth. These remote villages have mains electricity, but today there is a power outage and our dinner is cooked on a wood stove. This does feel like back country. Lasha tells me that the nearest school is nine km away down a jeep track. The children go off on Monday, stay with family near the school and head home on Friday. The guesthouse looks after us well; the table is well-laden and the blankets are thick. The peals of laughter that come from the mistress of the household suggest that Adishi has not given up hope. The village has no fewer than four churches and we visit the tiny medieval church of St. George, with frescoes inside and out. It has been a monumental couple of days. To ground myself in the familiar and to let Lasha hear the sound of Welsh, I play on my phone Mae Hen Wlad Fy Nhadau, the Welsh national anthem, as sung by Cerys Matthews. From Adishi, the logical route would be through the Chkhutnieri Pass to the southeast, but this 2722-metre pass is covered in snow and walking there could provoke an avalanche. Instead we walk northwest along the track taken by the schoolchildren, following the tumbling waters of the Adishchala. It is a stroll in the park after the previous day and I see a dipper, bobbing on a stone in the river. At the village of Bogreshi we join the jeep track to Ushguli which we will follow all the way to our destination. We are alongside the Enguri, another fast-flowing Caucasus river swollen with the melting snows of spring. After a 22-km walk that takes eight hours we bed down in a guesthouse in the village of Lalkhori. In the bedroom, a bust of Stalin stares down from on top of a wardrobe. It is so much nicer to be greeted by the Bard than by the Vozhd. The last leg of the journey to Ushguli. 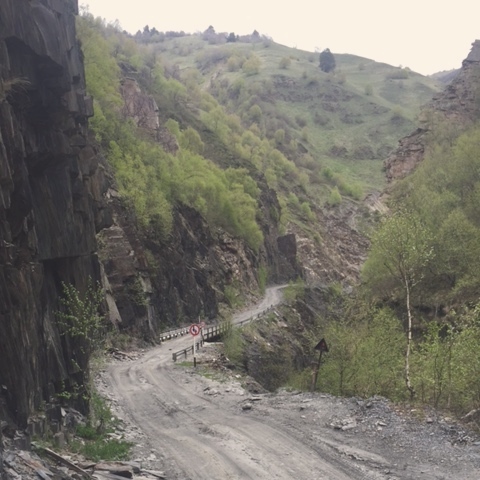 In places this is a very dramatic road – the views to our right are of rocky crags and rushing waters as the Enguri darts through narrow ravines. One feature of walks in the Caucasus is the need to cross boisterous brooks. Close to Ushguli I cross one on horseback, after a man out cutting firewood lends me his horse. We cover the nine km to Ushguli in three hours. The village doesn’t disappoint – it has atmosphere and history. It is actually a group of four villages, 2000 to 2200 metres above sea level, and one of the highest settlements in Europe. Lasha says that the medieval Queen Tamar of Georgia had summer and winter residences in Ushguli. The remains of her summer residence stand broodingly on a hill. Lasha guides me to a homestay, where the lady of the house is providing food and white wine for two elderly neighbours who have spent all day helping her to plant potatoes. Time for fond farewells from Lasha – it has been such a treat to walk with him. We have hiked together for 56 km and our conversations have ranged from the retreat of glaciers to the habits of wolves, from the problems of rural schooling to the Svan hunting goddess Dali. 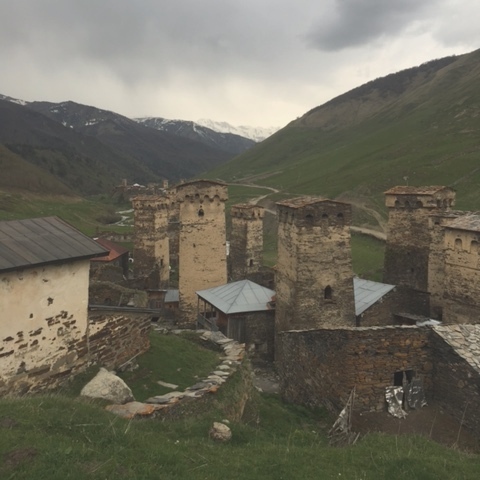 Back in the late 20th century, when economic and political turbulence swept the Caucasus, Svaneti acquired an unsavoury reputation for crime. 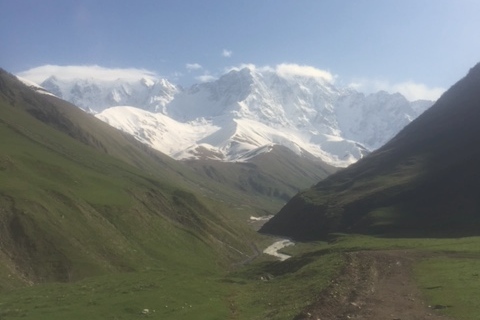 But in the early years of this century the Georgian authorities came down hard on bandits and during this trek Svaneti has felt no more dangerous than the English Lake District. Except for a few wisps of cloud around the summit, Shkhara is visible in all its glory – great ribs of rock but mainly a landscape of snow. This is one of the classic hikes of Georgia, but I have the trail of eight km practically to myself. The path follows the river Enguri which has its source on Shkhara and it’s an easy walk, with the majestic mountain ahead encouraging me on. Towards the end of the hike back I see two Georgian border guards and a boy on a horse. I commune mainly with cows and super-abundant frogs. Nowadays glaciers can induce feelings of melancholy. Work published this year by scientists at Tbilisi State University said that in 2014 the Shkhara glacier was about 300 metres shorter than in 1960. After the hike I need transport back to Mestia, 46 km to the northwest and connected mainly by rough jeep track. The going rate for jeep transport is 200 lari (about $87) but I get lucky and hitch a ride with Israeli tourists. They are travelling in a convoy of five SUVs and I am directed into a vehicle of Russian-speakers. Inside the vehicle I am in a different world. A walkie-talkie crackles and conversations on this and on mobile phones set the mood. Georgia feels very far away. I learn that my fellow passenger in the back was born in the Ukrainian city of Odessa. He comments that Georgia is poor. With limited Russian I can’t respond adequately, but try to tell him that in all five of the Svanetian houses where I have stayed the families have the usual range of modern things – television, fridge freezer and washing machine. Lasha tells me that thanks partly to tourism, standards of living in the region have risen considerably over the past decade. There is one cruel irony about Svaneti. The Svans are doing the right thing by the Earth; they plough with bulls for heavens’ sake. You can’t get more low-carbon than that. During 11 days in Svaneti I have seen innumerable bulls at work and two tractors. But all over the Caucasus the glaciers are melting because most of the world rushed into fossil fuel madness. The Svans farm the way they do not because they have read learned papers on climate change, but because this is the way they have always farmed. However, in no way does this alter the importance of their contribution. All of the families worldwide farming in traditional ways, with little or no use of fossil fuels, are surely heroes of our time. They should be honoured. I would give all of them the Nobel Peace Prize at the very least. Thank you for the virtual journey. Thank you Marta for following me on this journey. i am really very happy, that we were walking together through this days.